The Alexandria Queen Bedroom Group by Liberty Furniture at Northeast Factory Direct in the Cleveland, Eastlake, Westlake, Mentor, Medina, Macedonia, Ohio area. Product availability may vary. Contact us for the most current availability on this product. Drawer Suspension Drawers suspended using bolt-on rail system and full extension metal glides. Drawer/Shelf Construction All wood dovetail drawer construction with stained interiors. Case Details Clipped corner accents on pilasters. Framed edges and sleigh shapes on select pieces. Handles & Hardware Pewter knob and pull hardware. The Alexandria collection brings beautiful and traditional style to your home. 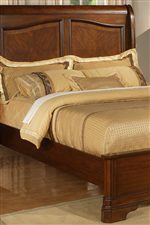 Crafted from select hardwoods and cathedral cherry veneers, this collection features bedroom and entertainment pieces to outfit your home. With design elements including quartered primavera borders, clipped corner accents on pilasters, and full stained interior drawers, Alexandria may be humble, but is certainly not without decorative detail. Convenient features such as full extension metal side drawer glides, felt lining on select drawers, and wire management provisions, this collection is also a practical one that makes organization easy. Finished in a rich autumn brown finish, Alexandria effortlessly warms your home in all the right ways. 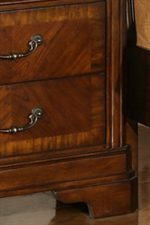 The Alexandria collection is a great option if you are looking for Traditional furniture in the Cleveland, Eastlake, Westlake, Mentor, Medina, Macedonia, Ohio area. 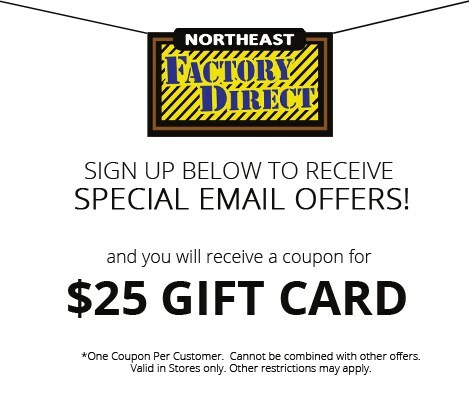 Browse other items in the Alexandria collection from Northeast Factory Direct in the Cleveland, Eastlake, Westlake, Mentor, Medina, Macedonia, Ohio area.